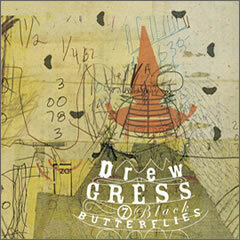 7 Black Butterflies is bassist/composer Drew Gress' follow up to his critically acclaimed 2001 Premonition title, Spin & Drift. Spin & Drift - called "one of the year's best sleepers" by the Washington City Paper - was a powerful showcase for Gress' playing and writing. 7 Black Butterflies ups the ante considerably. A CD length suite of all original music, this album is a tour de force of new jazz composition and performance circa New York City 2005. Gress' sophisticated time signatures, lush harmonic structures, and super modern melody writing combine with brilliant improvising from each of the players and unbelievably tight ensemble to yield a truly stunning modern jazz outing. Produced by experimental guitarist/producer David Torn (ECM), 7 Black Butterflies features Tim Berne, Ralph Alessi, Craig Taborn and Tom Rainey.